On the following pages we discuss all the issues and challenges that may arise during a thru-hike. Health issues and related questions about sanitation aren't too different from what hikers experience on other trails, but standing water and high humidity create new problems and complicate familiar ones. We explain Florida's weather patterns, which are surprisingly regular and predictable, as consequence of its peninsular shape. Without mountains to isolate hikers from pollutants that accumulate in large waterways, the question of drinking water is far more complicated on the FT than other National Scenic Trails. We review all the dangerous animals, bugs, and plants out there and what to do about them, as well as the dangers from our fellow humankind: hunting, fires, and strangers. Finally, we discuss what to do in an emergency situation, in case one arises. 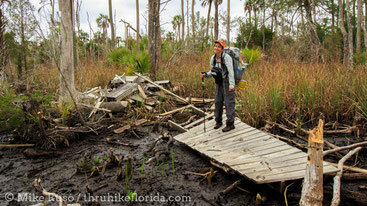 The most likely problem you'll face on the Florida Trail is an unexpected closure or reroute. Logging and fires, disputes with a private land owner, floodwaters, bridges damaged by a storm — these can all cause a closure and subsequent reroute, usually onto a road. The details are discussed below. A week before you leave to begin your thru-hike, check the FTA's trail closures and notices page for updates about trail closures, and make notes in your databook, guidebook, and maps about the closures. The page also includes information about changes in services that affect hikers, like campgrounds and outfitters. 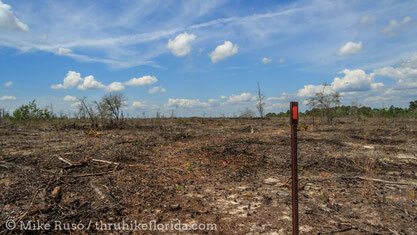 The issue that most diminishes the quality of the Florida Trail compared to its peers is the presence of active logging. Nothing hurts our hearts more than for the Trail to enter a clear cut. From what we have seen, no efforts are made to create a buffer around the Trail or protect it during logging operations. Machinery runs over the footpath and destroys trees painted with blazes. The footpath becomes lost in a landscape of destruction. Adding insult to injury, the Trail has even been used as a convenient landmark or boundary marker for cutting, with signs nailed to trees along the Trail that read "cutting boundary" or something similar. While the Trail passes through occasional private timber lands, when it does it stays on logging roads. The logging most disruptive to the Trail, resulting in closures, re-routes, and even its complete destruction, happens on public land controlled by the agency that is supposed to be the Trail's steward. Tasked with managing the Trail, the National Forest Service has demonstrated over and over again how little it values the FT.
To be worthy of its National Scenic Trail name, and to fulfill Congress's mandate that created it, the Florida Trail needs to exist within a protected corridor. Our vision is for a two-mile wide buffer on either side of the footpath where all logging, mining, oil and gas pumping, and other forms of resource extraction are completely prohibited. Please get involved to help us make this vision a reality. 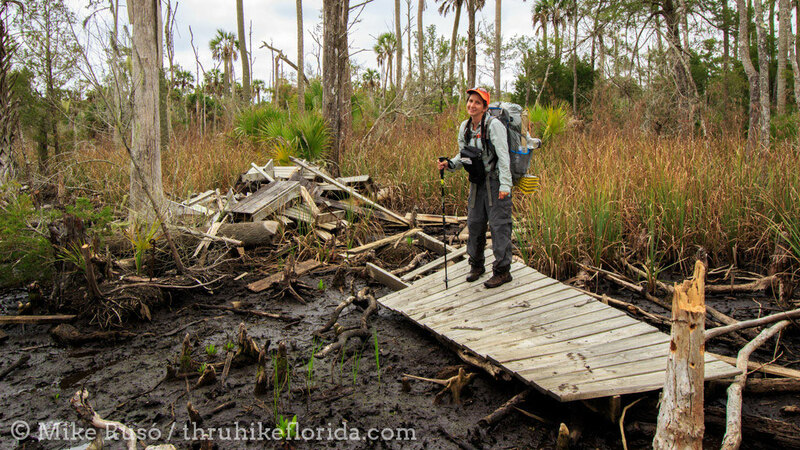 We need to say first that the volunteers who work on the Florida Trail do a tremendous job and we appreciate everything they have done and continue to do. We would like to see many, many more volunteers however, because the Trail needs it. Most trail maintenance as well as new trail construction takes place in November, in preparation for the upcoming hiking season the following January. There is a lot to do before Christmas, and not much time to do it. In sub-tropical Florida fast-growing plants quickly obscure the Trail. Wild boar root up hundreds of acres, and thick weeds grow in the disturbed soil. Blazes need to be repainted after lightning-strike fires and controlled burns destroy or obscure them. Blowdowns and widowmakers need to be chainsawed and cleared away. A shortage of volunteers means some of this work does not get finished before thru-hikers start arriving, and causes a closure. If a bridge or boardwalk has been damaged in a storm or has simply decayed over time and someone might decide it is unsafe to cross. If volunteers do not repair or replace the structure quickly, that section of Trail then is closed and a temporary reroute established, invariably on roads. When this happened to us on our thru-hike, we ignored every closure notice and simply walked through the water when we reached the dilapidated bridge. If a new section of trail or permanent reroute through forested lands is not completed by volunteers and "certified" by the US Forest Service in time, then thru-hikers are directed onto a temporary reroute, usually a roadwalk. In the past we have ignored these closures as well and walked the "uncertified" trail segment, which was perfectly hikable. We didn't let the slow crawl of bureaucracy stop us from hiking. These situations arise only because the FT does not have a robust volunteer base comparable to the Appalachian Trail. The ATC has said many times that the Appalachian Trail is the largest all-volunteer effort in the world. That kind of success has not yet been duplicated in Florida, but you can help. 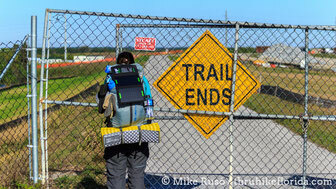 The Florida Trail traverses the outer norther edge of Eglin Air Force Base, which can be closed to civilians/recreation at any time without explanation. With this in mind, the Trail has been routed through the areas least likely to be closed, and that has worked. 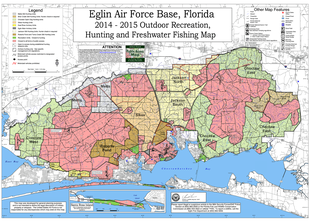 The Trail is rarely closed through Eglin, though it remains a possibility. There is a surprisingly large amount of outdoor recreation on the base, including hunting. To help civilians enter the base lawfully and not enter closed ares, the Air Force maintains jacksonguard.com, where you can find their Public Access Map. the base is divided into areas with names like "Jackson North" and "Choctaw West"
Closures result in temporary reroutes onto roads, adding to the total mileage of roadwalking required of a thru-hiker. Since the FT is incomplete, the gaps between sections are linked by roadwalks. 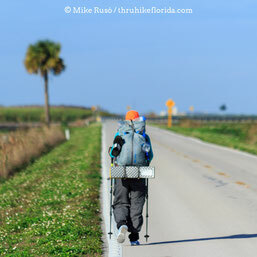 In recent years the total roadwalk mileage has hovered around 300, and little progress has been made at reducing that number. The FTA claims the entire trail is marked with orange blazes, but we know from experience that blazes can be very far apart or nonexistent on roadwalks. The FTA map set is an invaluable tool to keep you from getting lost. Do not attempt a thru-hike without it. Unfortunately some of the roadwalks are along big roads with lots of traffic and no sidewalk. Walk against traffic so that you can see oncoming vehicles, regardless of which side the blazes appear (if there are blazes at all). The 300 miles figure cited above is deceptively low, since it only includes "hard" roadwalks on paved roads, and does not include the many miles of "soft" roadwalks atop levies and on dirt forest roads. We have not been able to calculate the mileage for these soft, off-road roadwalks, but our guesstimate is that it could be another 100 miles. Walking a dirt road through a forest is not the same as hiking a trail, because the feeling is of walking next to the forest, rather than being immersed within it. Completing the FT and eliminating all the roadwalks, both hard and soft, is a great challenge facing the Trail. Get involved to help make it happen.